Looking for hotels near Tractor Museum? Located in Villa Carlos Paz, Alta Morada is a modern and comfortable self-catering bungalow with free WiFi access. 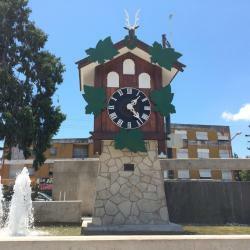 Featuring a seasonal outdoor swimming pool as well as a garden, Cabañas del Rey is located in Villa Carlos Paz, within 2.8 miles of Cuckoo Clock and 3.3 miles of City Hall. Offering mountain views, Casa hermosa vista in Villa Carlos Paz provides accommodations, a seasonal outdoor swimming pool and barbecue facilities. Free WiFi is offered. Featuring a seasonal outdoor swimming pool as well as a garden, Complejo Casitas De Emma is set in Villa Carlos Paz, within 2.2 mi of Cuckoo Clock and 2.7 mi of City Hall. Free WiFi is available. 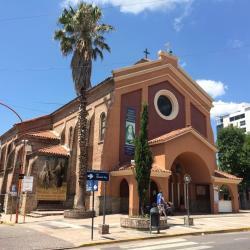 Featuring free WiFi and air conditioning, Refugio Playa Perelli is located in Villa Carlos Paz. Cuckoo Clock is 1.6 mi away. Free individual private parking is available on site. 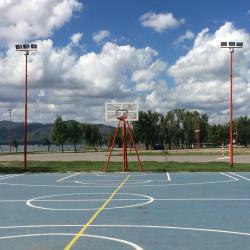 Offering free WiFi and a seasonal outdoor pool, Los Frutales is located in Villa Carlos Paz. Cuckoo Clock is 1.6 mi away. Free private parking is available on site. Boasting an outdoor swimming pool and chic rooms with mountain views, Tagore is only a 5-minute drive from downtown Villa Carlos Paz. Guests can exercise at the gym. There is free WiFi access. Boasting a chic swimming pool on a terrace overlooking San Roque Lake, this spa resort set in a Mediterranean-style building. Rooms have private balconies and free Wi-Fi. Boasting an outdoor pool and located a mere 656 feet from San Roque Lake, Hotel La Colina del Sol offers accommodations in Villa Carlos Paz. Featuring a seasonal outdoor swimming pool and garden, as well as a restaurant, CAPRI is located in Villa Carlos Paz. 1.7 miles from Cuckoo Clock, the property is also 2.2 miles away from City Hall.